My name is Richard Robinson, I’m 61 years old, and I am currently living on Social Security Disability and a very small Veterans pension. For 24 years I was a long hall truck driver, I traveled all 48 states, Canada, and Mexico. While I was in Copper Mountain, CO unloading, I had 1800 lbs of steal drop from an overheard crane on top of me. At the time they pronounced me dead, but fortunately they were able to jumpstart me, bring me back. I recuperated for about a year, and then went back to driving for a short time. However, with an inoperable back, I was needing to take higher and higher amounts of pain medication, so it became clear that it was no longer safe for me to drive. So the SS administration and my doctors named me disabled and unable to drive, and I started receiving SSDI benefits. I was in quite a bit of pain, myself and my wife at the time, were in an apartment with 14 stairs up to the bedroom, and I was in so much pain I couldn’t walk up to the bedroom some nights. So we decided we needed a home that was all one level, so we started looking at some manufactured homes. We decided to move into Westwood Village community, we were planning to just move in temporarily and rented a single wide for a year. Within 5 months we fell in love with our community, our neighbors. The community feeling was exactly what we wanted, so we stopped looking at other homes and purchased a double wide trailer in Westwood Village. Once we decided we were staying, I had a neighbor within two months who had to leave because she could no longer afford the rent. I was already friends with her, so I was sad to see her leave. Then I heard of others who were leaving because they could no longer afford the rents. I wasn’t sure what was going on but it disturbed me. I heard about a HOA meeting the community held once a month, and I decided if I was going to live in the community I should get involved. So I went to a meeting in March, sat in the back and listened, I can’t remember what I thought, but I decided to go back for a second meeting in April, and don’t ask me how, but I walked out of that meeting president of the association. The more I saw the way rent was going up and maintenance was non-existing, that bothered me, so I decided I was going to start attacking maintenance issues. I also kept noticing people having to move because of the rent going up. For me personally at that time I still did not understand, why $20 made that much difference that they have to leave their home, so I focused mainly on maintenance. Within in a few months of being the HOA president I got involved with a bunch of homeowners from around the country on a phone call they were holding once a month, and we exchanged ideas and concerns about ELS. Soon after we realized these issues were more and more associated with all manufactured home communities across the nation, not just ELS and we started an organization called manufactured home action, MHAction. One of the things this organization was looking into was Social Security, retirement issues, and economic justice. These were all things that were new to me, I never thought I’d be involved in any political movement, or what was to come. I started really studying how Social Security worked, and realized many of my neighbors, especially the elderly women, were living on really low amounts such as $700 or $800 per month. Suddenly I realized how much $20/month increases on an already $500/month rent meant to some of these folks, and I got furious. I got mad every time I found someone in my community or elsewhere in Utah had to move because $20/month meant the difference between eating or having a roof over their head. 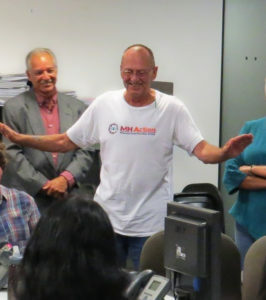 With MHAction, I’ve taken on working to strengthen Social Security. There are things we need to change, like creating a caregiver credit. So many mothers, some fathers even, have to stay home and care for a child that is disabled or sick, or a parent that needs to have someone there with them, and they are unable to work and pay into Social Security. It is those folks that are giving of themselves for someone else that when the time comes their basically penalized, by receiving less in their monthly check. That needs to be changed, so that caregivers and parents don’t have so sacrifice their future economic security by caring for their loved ones. At this time when I started working on these issues we were under the presidency of Obama, and with Utah being a very Republican state, I was against a lot of the issues and stances and policy that the Obama administration was for. Being blind for so many years I followed that trend, but also studying and getting involved in the issues at hand, after making it personal, I started to find that the Obama administration, the Democratic administration was doing some of the right things. But I still stand by the Republican stance that we need to cut federal spending. And by that I mean the wasteful spending in Washington on trips and parties, and things that don’t effect Americans across the nation. However, now that the Trump administration has taken office, and president Trump has started laying out his budget for this year and for the future, I see they are attacking vital programs. Any cuts in Medicare, Medicaid, Social Security, Veterans Benefits, I am 100% against. Many Americans across the nation rely on these programs, to be able to live in their own home, to be able to go to the grocery store and buy food so they can feed their family a decent meal. These programs allow Americans to be Americans and live in dignity. Take Veterans benefits for example, rather than penalizing our Veterans, we should be increasing their benefits. I don’t say that because I am a Veteran, I say that because these are men and women that were willing to give their life for our country, for our freedom, and to cut their small pension and other benefits is a slap in the face. Medicaid and Medicare are also important to many, including myself. Once I became disabled I also needed to apply for Medicare, so that I could continue to treat the condition that I now had because of my accident. I was fortunate enough to truly benefit from these programs, Medicare was great for me. With my wife’s insurance coverage as well, it enabled me to have two or three needed surgeries without saddling me with thousands and thousands of dollars in debt. So for me, Medicare was a godsend. I know there are many people that without Medicaid or Medicare, they would not be able to go to the doctor. Even today with Obamacare, despite the push to have every American covered by medical insurance, I today know people that are uninsured, period. A perfect example, my daughter and her husband. She works for a company that does not offer insurance, she has Medicaid for the children, but she herself is uninsured. Yesterday she had to have emergency gallbladder surgery. Fortunately, it was a quick and easy procedure, but her biggest concern before going into surgery was the money. She was in tears saying, “dad how am I going to afford this,”. So, that’s one example, but there are countless numbers of Americans who are not insured. We need to make insurance more affordable so this is no longer the case. But for those who are insured through this very important program, Medicaid, especially for the children, it makes all the difference. This could mean the difference of whether a child gets vaccinated, or whether a child has to suffer at home in sickness rather than being able to go to the doctor and get medication that would help them. Medicaid, Medicare, Social Security, the programs that they have for Veterans, these are all programs that are developed by our government to care for our own. America is proud to be able to help, and I’m proud that America is able to help others in cases of natural disasters, and in times of need around the world, but it’s also time for us to take better care of Americans that live here at home. It’s time we expand Medicaid, Medicare, Social Security, Veterans Benefits and Food Stamps, it is time to strengthen these programs, not hack at them and cut them. It is not time to suddenly tell a child that they can no longer go to the doctor because there is no more money in Medicaid, that the state has ran out of their block grant, and there is no more money. It is not time to tell future generations that they are not important enough to take care of when they are of age to draw Social Security. Every administration comes into office wanting to make America great again. To make America great again we need to take care of our own at home. To build a stronger America means to build a stronger American, and you can’t build a strong American by cutting the essential programs that allow him, or her, or a family, to live in dignity.